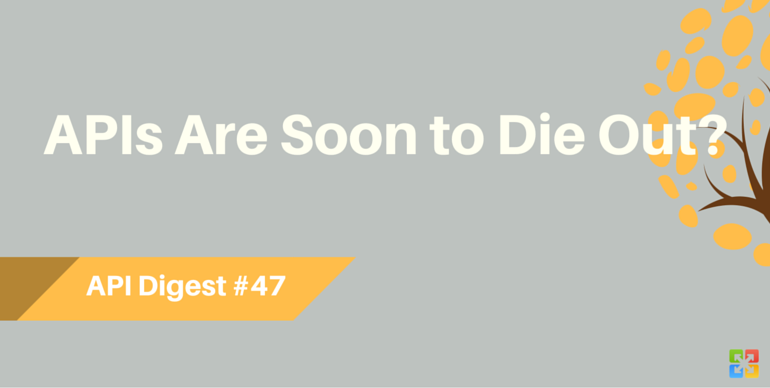 API Digest #47: APIs Are Soon to Die Out? Even in the heart of summer, by far the majority of API community are working at full pace, discovering new API opportunities and sharing useful ideas. We have gathered the berries of them and prepared a refreshing cocktail of latest API news and articles. How API first design can help avoid common failures, how to create a brand guide for your API, how to build an API platform that incentivizes developers, and more in this API Digest. Enjoy! Can you imagine the world without APIs? No? Well, Niko Nelissen can. Read his article on how bot-to-bot could soon replace APIs. Mike Stowe has shared his experience of how not to build APIs that nobody wants. For details, go how API First Design Can Help Avoid Common Failures. When it comes to offering the best developer and user-experience possible, the devil is in the details. Learn what they are in Lorinda Brandon’s three part series on how to nail three subtle keys to API greatness. Without a branding guide providers offering a public API leave their company / product name, logo, style, and message open for reproduction in untasteful ways. To help them avoid this, Bill Doerrfeld explained how to ensure reproductions on third party channels happen in the best way possible. Andrew Noonan, Partner Engineer at Uber, has been interviewed for TechCrunch. In the interview, he speaks about the evolution of the company’s API and a systematic approach to building an API platform that incentivizes developers. Bryan Kirschner knows why every CIO needs to know that some APIs don’t matter. Read to find out what specific characteristics distinguish APIs that have the potential to move the needle on digital competitiveness from legacy APIs that don’t. “Cloud access security brokers that take an API approach can provide more comprehensive security without impacting network performance”, claims Ganesh Kirti. Read more in Why APIs beat proxies for cloud security. For more API news and insights, read API developer weekly #117 by Keith Casey and James Higginbotham. Come back in a fortnight. In the meanwhile, suggest us topics to include. In case you’d be interested to find out more about what our API does, hit us up on chat, schedule a quick call, or test how it works.